Learn gentle stretch and exercise fitness tips for your three-legged Tripawd dog. Learn exercise and fitness tips for three-legged amputee dogs with free PDF brochure from the Animal Medical Center in New York City. 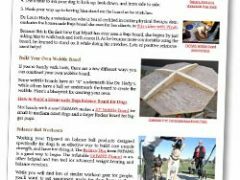 Download free plans to make a homemade Buja style wobble balance board for three legged dogs to exercise core muscle strength and help develop balance.